Drew Lewis was one of 120 athletes to represent Alabama, with 14 of them competing in track and field in the Special Olympics USA Games July 1-6 in Seattle. Photo special to the Journal. Dara Tribble never figured her son would become a runner. But there was Drew Lewis running for Team Alabama in the Special Olympics USA Games July 1-6 in Seattle. Lewis has dyspraxia, which is a developmental coordination disorder. He didn’t start walking until he was almost 2 and needed assistance from his parents to walk around the house. “So, the fact that he’s running track, doing anything with track, is amazing,” Tribble said. After participating in the opening ceremonies July 1, Lewis competed in the 100-meter run the following day and the 200-meter July 3. 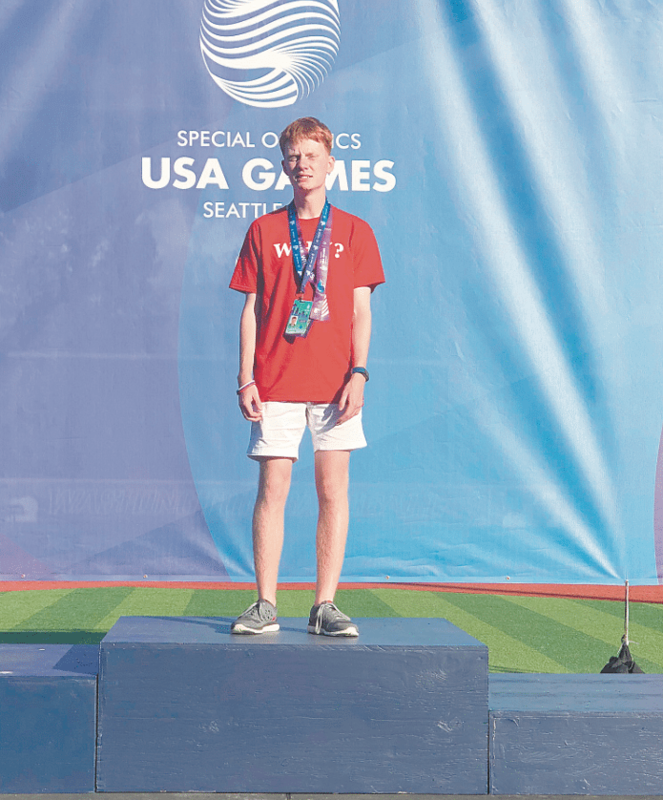 For Lewis, a junior at Mountain Brook High School, the experience was nearly indescribable as more than 4,000 athletes and coaches from all 50 states and the District of Columbia competed in the games, which come around every four years. Lewis was one of 120 athletes to represent Alabama, with 14 of them competing in track and field. His mother was equally ecstatic. “He absolutely had an incredible experience,” Tribble said. “Team Alabama flew on a charter plane all together and stayed in the dorms at the University of Washington. The opening ceremonies were amazing with all the states represented and the torch being lit at the end. Lewis began running in the first grade, competing in shorter distances such as the 50-meter sprint. A few years later, he began running longer distances and becoming more competitive. The thing he loves most about running, Lewis said, is feeling the wind on his face and in his hair. To compete in the Special Olympics USA Games, runners had to compete locally and win their heat before moving on to the state level, where they had to qualify to be considered for nationals. Lewis won gold in both the 100-meter and 200-meter at the Special Olympic Alabama Games in May at Troy University. The performance qualified him to be eligible to be chosen for the USA Games. The athletes were pulled at random from a pool because so many athletes per state were able to attend nationals. Lewis coach, Jane Mosakowski, attended the competition in Seattle with Lewis and his family. Mosakowski has been working with Lewis since 2015, and she was overjoyed to see him run in the USA Games.